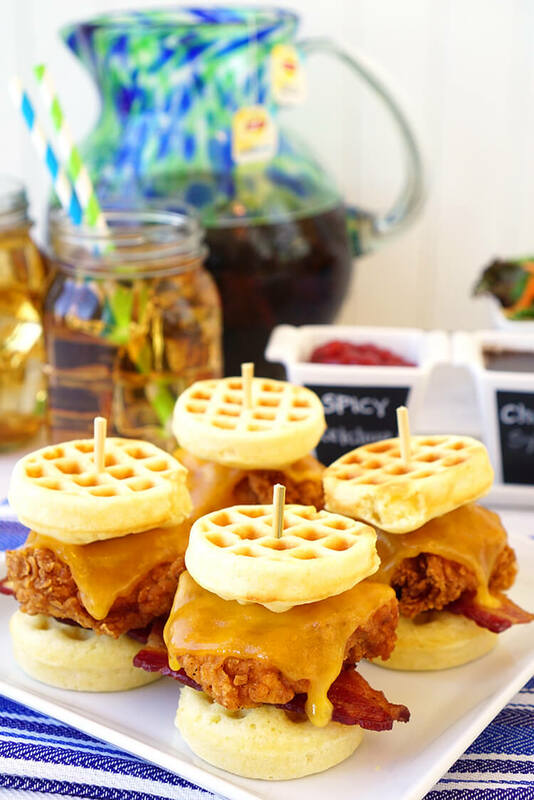 These chicken and waffle sliders with bacon and cheddar cheese are a mini-sized twist on the classic chicken and waffles dish that we all know and love. Sure to be a big hit with your entire family! A couple of weeks ago, I took a quick business trip to Texas, and while I was in Austin, I had some of the most delicious chicken and waffles that I’ve ever eaten. We dined al fresco on the patio in the early autumn breeze, and with good company and charming scenery, it felt like quintessential fall comfort food at its best. 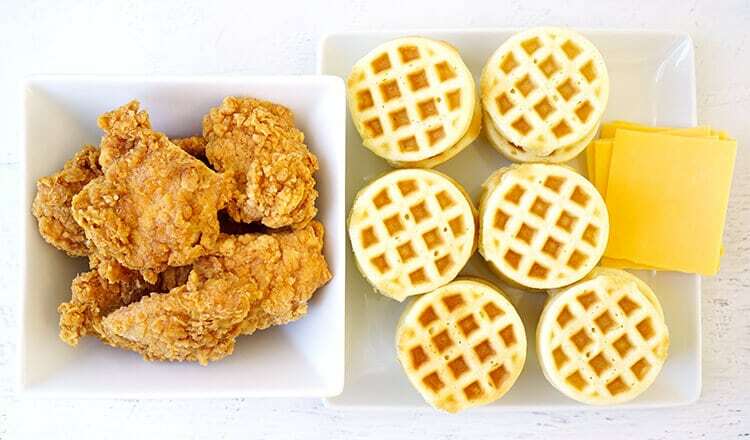 I came home raving about the juicy and spicy chicken paired with a savory cornmeal waffle, and my three boys immediately asked me to try to recreate the recipe at home so that they could try it for themselves. 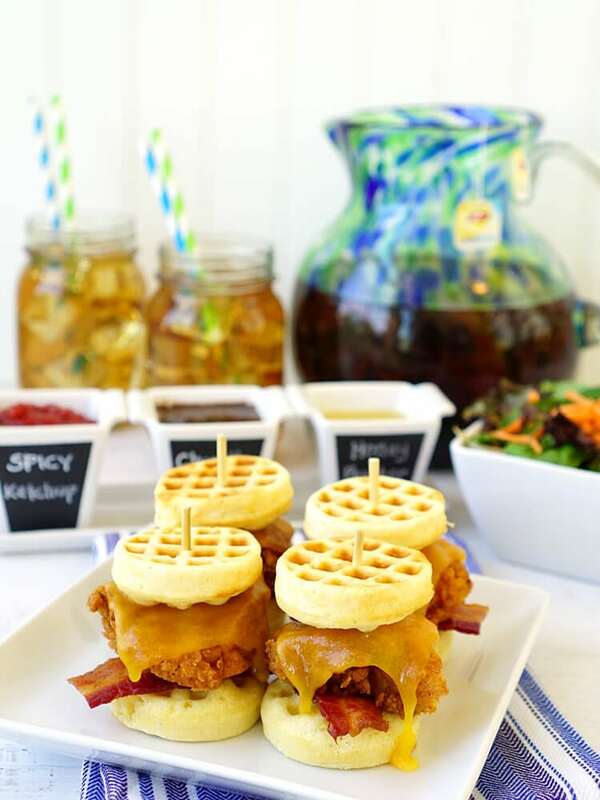 I decided to put my own “Boy Mom” spin on it, and I came up with a recipe for chicken and waffle sliders that I knew they’d love. The chicken and waffles that I had in Austin were paired with a refreshing and crisp iced black tea, so I made a pitcher of my favorite Lipton Cold Brew iced tea to go along with my sliders. I simply added two family-sized tea bags to a 2 qt. pitcher of cool water, and allowed it to cold brew for 5 minutes. 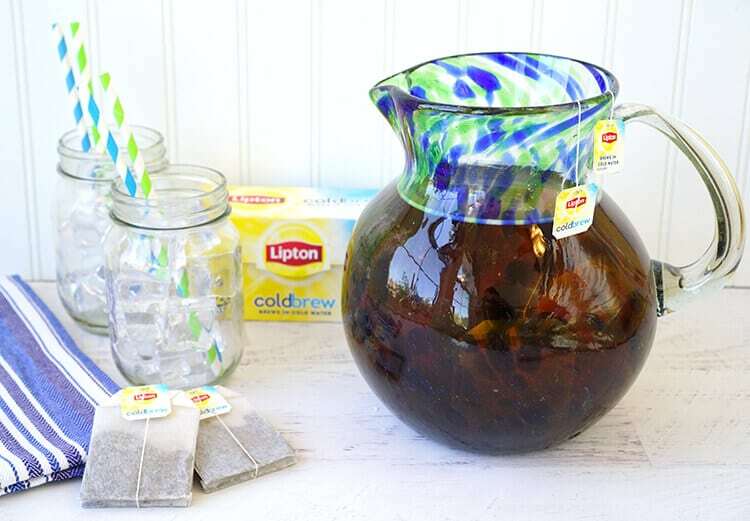 I love that Lipton Cold Brew allows me to make fresh-brewed iced tea without needing to boil water! While I waited for the tea to steep, I whipped up a batch of cornmeal based waffles inspired by my favorite cornbread recipe. 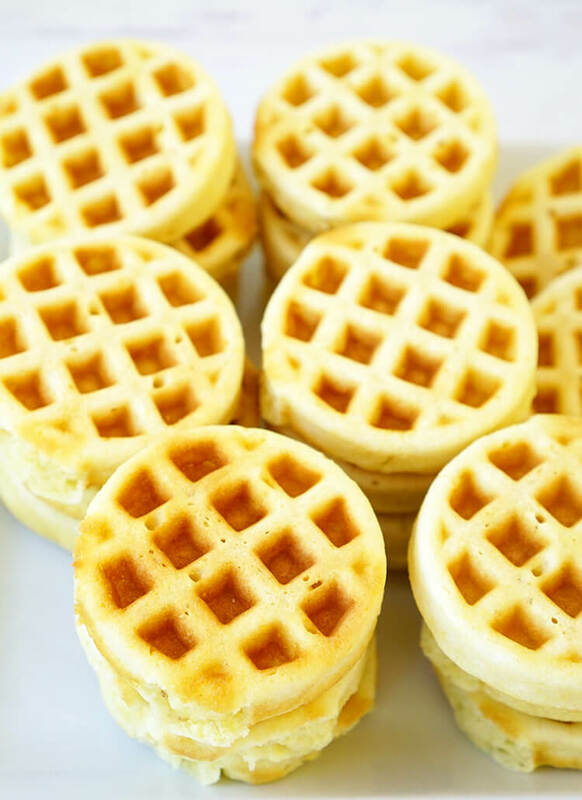 To get these cute little mini waffles, I actually used my boys’ Mickey Mouse mini waffle maker (without the ears, of course!) 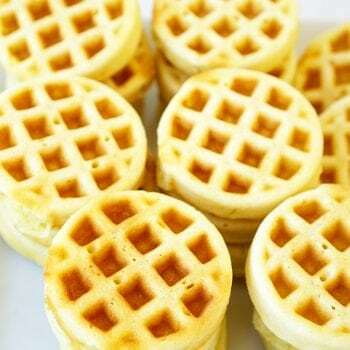 since I don’t own a mini waffle maker. It worked like a charm! Though judging by how much my family loved this recipe, it might be time for me to invest in a real one! In the meantime, the Lipton iced tea finished brewing without any effort at all (woohoo! ), and it was ready to be poured into glasses over ice. 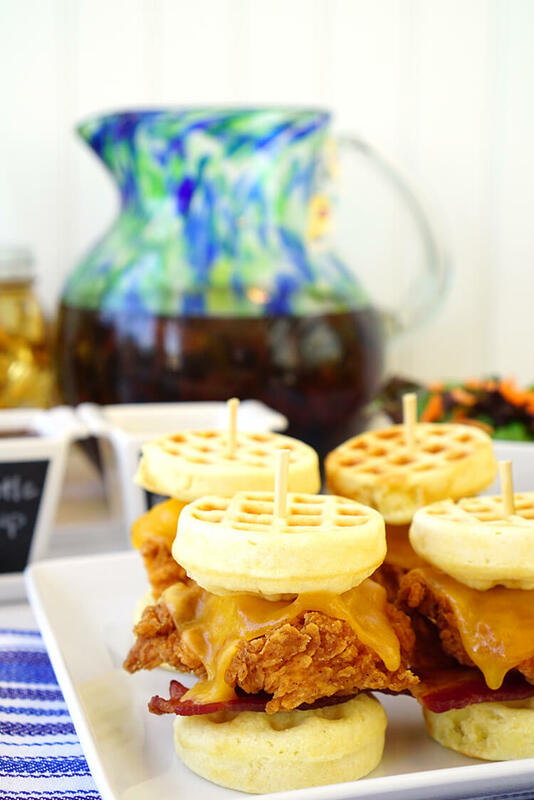 I prefer my iced tea unsweetened, but adding a bit of simple syrup will turn it into a tasty sweet tea that pairs perfectly with the southern-style chicken and waffle sliders. Our local deli sells some mouthwatering mildly spicy chicken strips, so I picked up a few to use in my sliders. I’m not going to lie, frying food is not really my forte, and it occasionally ends in disaster, so I like to leave it to the professionals. Besides, the deli’s spicy chicken strip recipe is seriously Y-U-M-M-Y, and I’m not sure that I could top that! 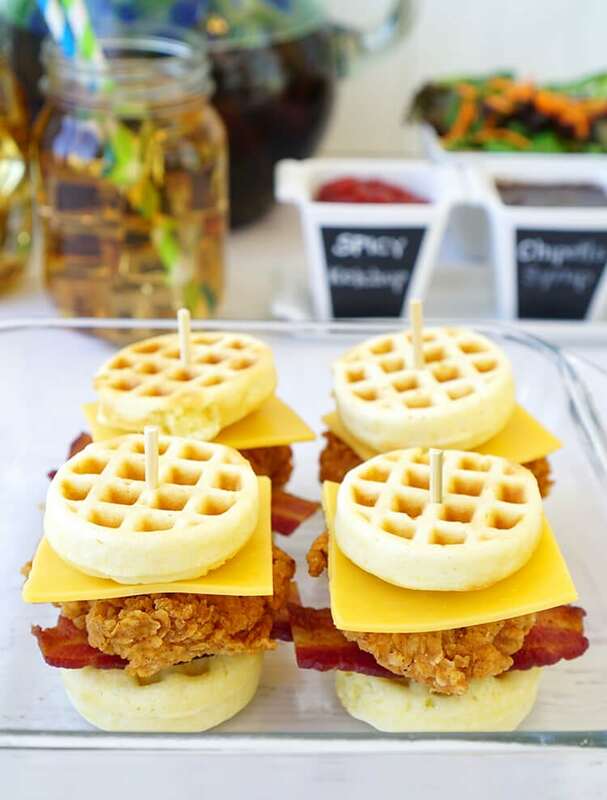 If you want to make your own version of these chicken and waffle sliders, feel free to use your own fried chicken recipe, or pick up some chicken strips from your favorite deli like we did. 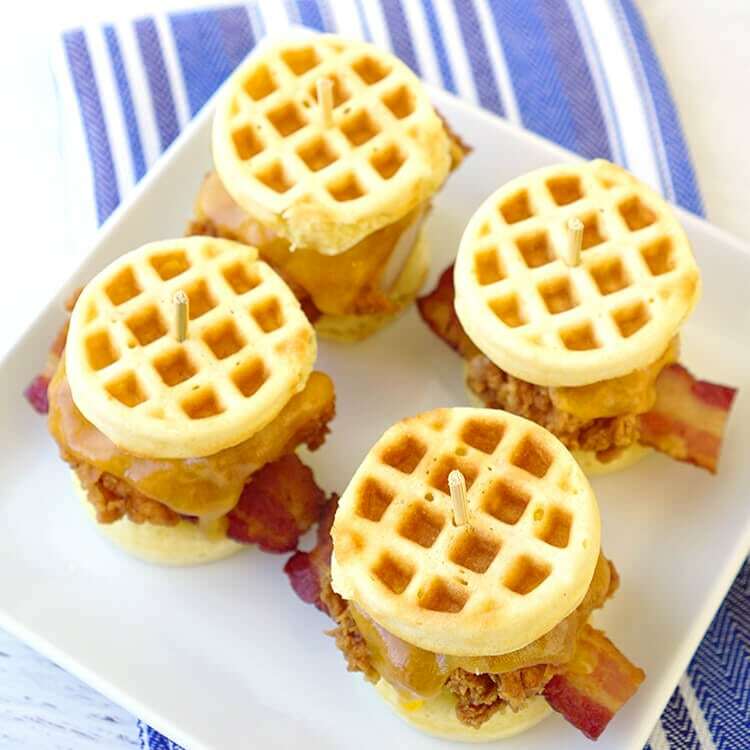 I pre-heated the oven to 300 degrees while I assembled the chicken and waffle sliders – a cornbread waffle base topped with pre-cooked bacon, chicken, cheddar cheese, and finished off with another waffle. SO many delicious layers of flavor bursting from one little package! I put the sliders into the oven and made a few quick dipping sauces for the boys. Since they’re all fans of different flavor profiles with their chicken and waffles, I made an eclectic assortment including spicy ketchup (ketchup mixed with cayenne pepper to taste), chipotle maple syrup, and honey butter. For the chipotle maple syrup, I thinned pure maple syrup with a splash of the Lipton iced tea and added chipotle pepper powder to taste. Supper tasty! Once the cheese is melted and the chicken and bacon have a nice sizzle to them (about 5-10 minutes), it’s time to take the sliders out of the oven and eat! 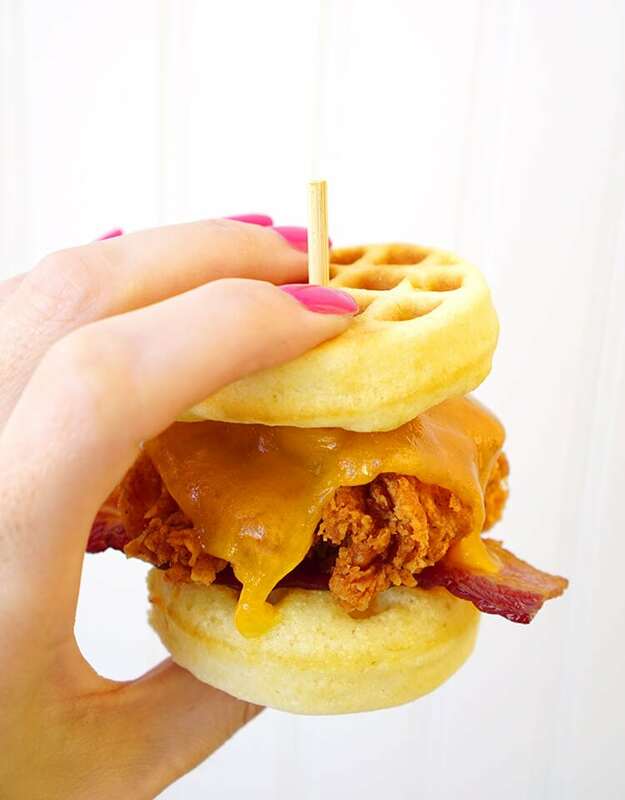 It’s really hard to accurately describe how incredible these chicken and waffle sliders actually are. I mean, c’mon…sweet and savory cornbread, fried chicken, bacon, and gooey cheese all in one southern-inspired bite? It’s heavenly! My entire family kept saying, “This is really good. Like, really, REALLY good.” over and over again throughout the meal! My boys asked if they’re as good as the chicken and waffles that I had in Austin, and I actually think that I totally replicated the exact same taste (with a little help from that deli chicken!) – yay! I have a feeling that this is going to be showing up on our dinner menu quite frequently, especially on football Sundays. 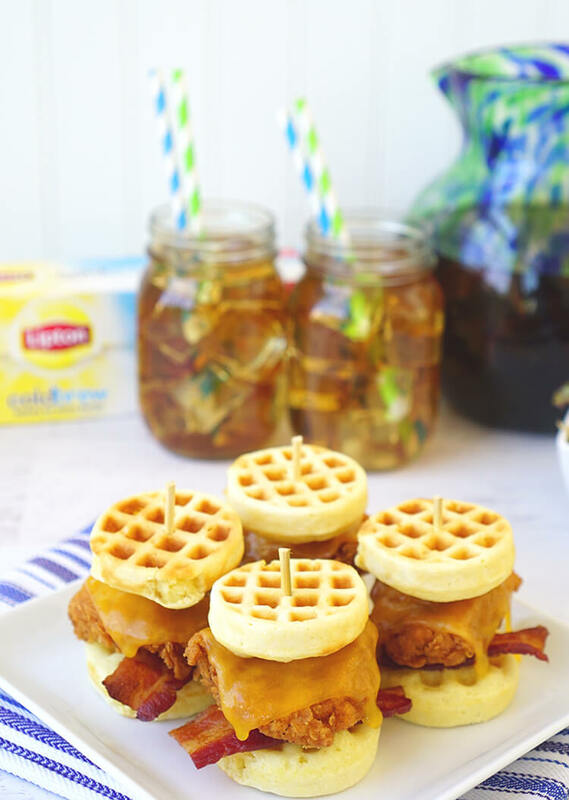 Chicken and waffle sliders are perfect for tailgating! Preheat waffle iron and spray with cooking spray if necessary. In a small bowl, combine honey, buttermilk, melted butter and egg. In a large bowl, combine cornmeal, flour, baking powder, salt and sugar. Bake in waffle maker according to manufacturers directions. 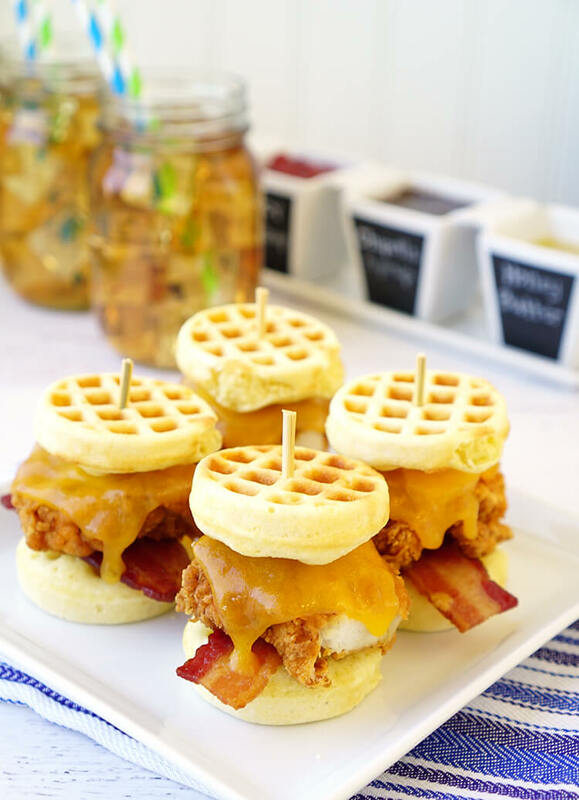 To make chicken and waffle sliders, layer cornbread waffles with fried chicken, bacon, and cheddar cheese. I’m so glad that I was able to bring a taste of Austin home to my family and share this special meal with them. Now they want to go visit Texas and do a taste test comparison with the original! 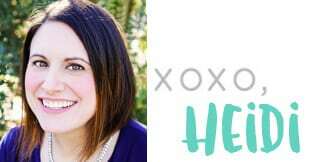 I foresee a family vacation to Austin in our future! 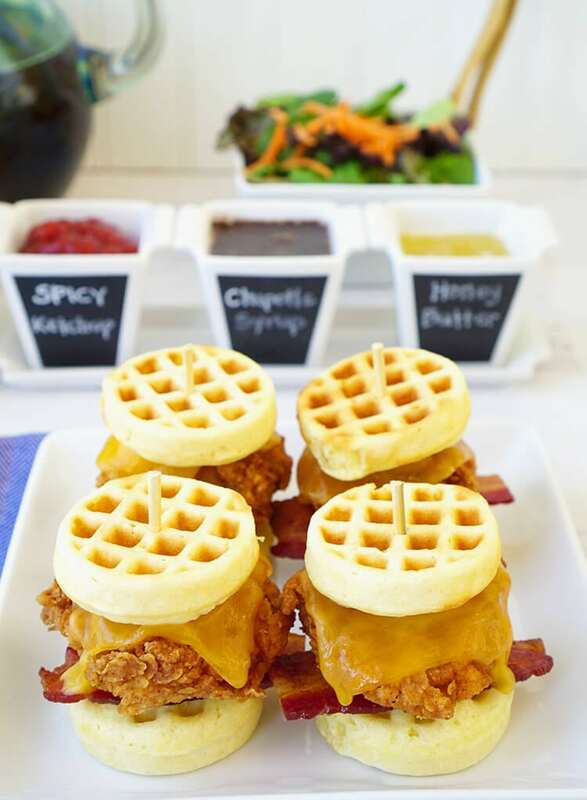 These chicken and waffle slider are sure to be a hit with your family, too! 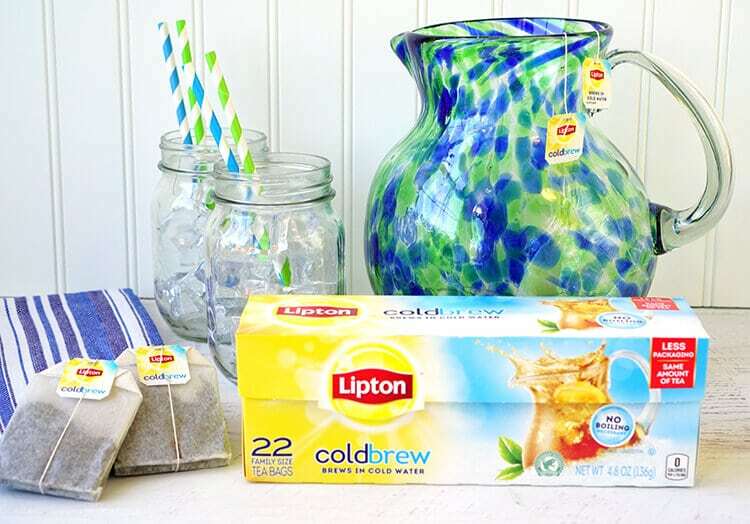 It’s a creative spin on a classic that’s been well-loved from generation to generation, just like Lipton iced tea. 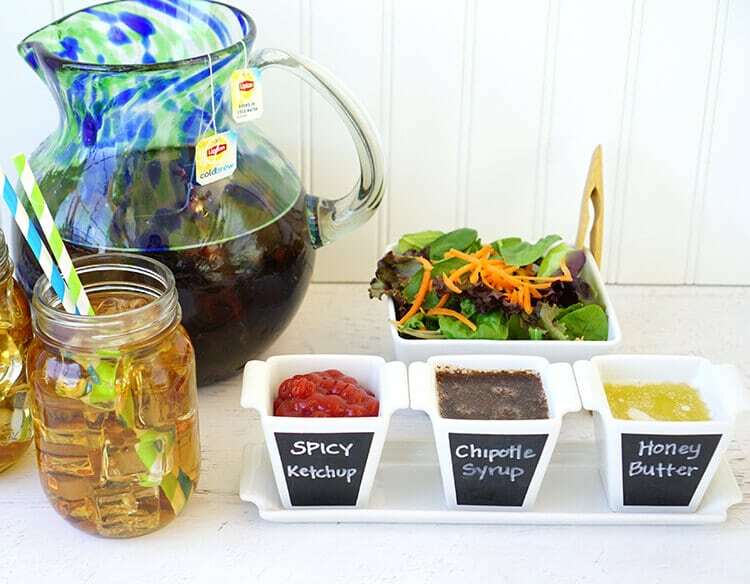 There’s just something about a family-sized pitcher of fresh brewed iced tea that really brings this entire recipe together! For more delicious fall recipe ideas, be sure to check out the Lipton Bright Bites website!